To maximize your oral health, we recommend a yearly set of x-rays to accurately diagnose and treat problems that cannot be seen with the naked eye. When a problem is detected early, it will prevent more serious issues from occurring. Most commonly, dental x-rays reveal cavities that may be present in the teeth. Also, it is possible to view a picture of what is happening below the gum line. There are a few common forms of x-rays that may be taken during routine dental exams. Bitewings: These display the crowns of your teeth. They are used to look for early signs of decay. During a routine exam, a dentist will usually take two to four bitewing x-rays. Periapical: This is used to view a tooth’s bone height or root tip, this type of x-ray is taken. 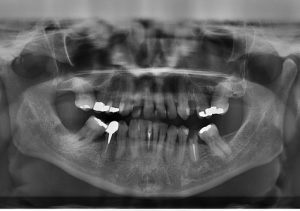 Panoramic: Unlike other dental x-rays, a panoramic is taken from the outside of the mouth. It offers a picture of the entire mouth. The image shows all of the teeth, jaw bone, and sinus areas. It is most commonly used to identify bone problems, impacted teeth, or cysts. Due to the negative stigma of radiation exposure, many people are fearful of x-rays. However, the American Dental Association explains that routine dental x-rays are safe. Your dentist will evaluate each patient’s case and recommend x-rays when necessary. Since the latest radiographs and machinery are made to minimize radiation exposure, they are not considered harmful. Patients will wear a lead apron for added protection as well. Anyone experiencing a problem in their mouth should visit his or her dentist. Upon examination, a dental care provider will probably order a set of x-rays to assess the issue. Otherwise, dental x-rays are commonly taken once a year during routine check-ups. If you are pregnant, it is essential to discuss x-rays with your doctor before they are completed. If you have questions about dental x-rays, feel free to contact our office. Our experienced staff will put your mind at ease and address all of your concerns. We are concerned with the oral health of our patients and work hard to deliver bright and beautiful smiles in a safe and effective manner. 5 Ways to Strengthen Your Tooth EnamelHow Can I Kick My “Sweet Tooth” This Holiday Season?